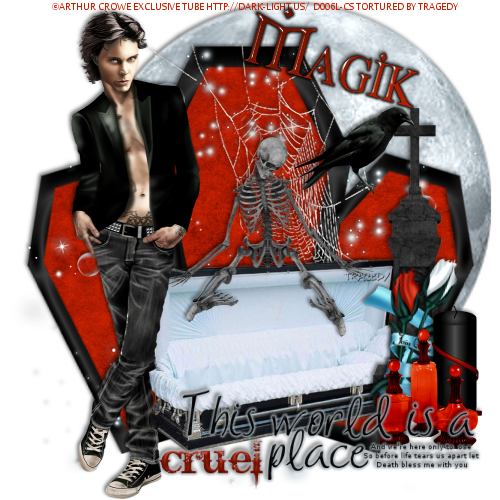 Arthur Crowe tube exclusive to the Dark Light Website & Magik's CT.
Join Me (Ice) kit from Manipulated By Magik. Get it HERE. Position toward the upper right side of the canvas. Select the inside of the frame using your magik wand. Position over the center frame. Adjust, Hue/Saturation set to 0. Center over the top of the casket. Position over the right of the casket. Use your deform tool to position on a slight angle at the bottom of the headstone. Position over the right side of the roses. Position at the bottom of the candle & Roses. Position between the top of the middle and right frame. Position between the left and center frames. Position over the bottom right of the tag.